Echelon, a chapter of early to mid-career professionals supporting The Salvation Army, recently launched an online calendar to allow people to sign up to supply bags of fruit for homeless neighbors to help with malnutrition among these marginalized neighbors. The community is invited to participate. 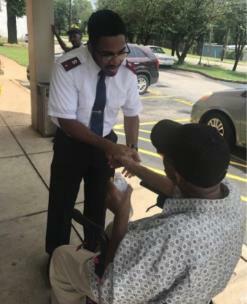 According to Lt. James Harvin, officer over the 614 Corps and Day Shelter on McCallie Avenue, the problem can be severe with some homeless neighbors exhibiting symptoms of scurvy, a disease resulting from a lack of vitamin C that can result in gum and skin diseases, personality changes and problems healing. “Our community has always been generous to help with food drives, but this problem is more than hunger,” said Tripp Thurston, president of Echelon. The challenge has been in how to organize contributions so that the Day Shelter has a steady supply of fresh fruit in the right quantity. The answer for Echelon is in the free google appointment calendar, youcanbook.me, that allows people to sign up for a day and time. “By signing up to bring bags of fruit, we’re assured that every donation will be used and the fruit we serve is fresh,” said Mr. Harvin. To participate, visit https://chattechelon.youcanbook.me. For anyone using one of the new grocery delivery services, simply type in the address, 800 McCallie Avenue, and specify they deliver to ReCreate Café. “This is a great project for church and school groups, and for companies looking for opportunities to make an impact on our community,” said Mr. Thurston.